Most of the kids love to eat this chaat. Bread is the most favorite for many kids. It is very simple and delicious. 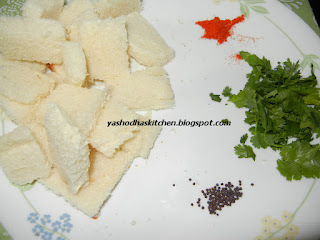 It looks like bread upma, but not really. My little one loves it very much. You can try this recipe for sure. Remove the brown edges from the bread slices. Cut them into small pieces. Heat oil to deep fry all the sliced breads until it should be brown color on both sides. Heat 2 tsp of oil in a pan for seasoning, add mustard seeds. Once it splutters, add curry leaves, green chillies, onions and fry for half a minute. Add ginger, garlic and fry until its raw smell goes. 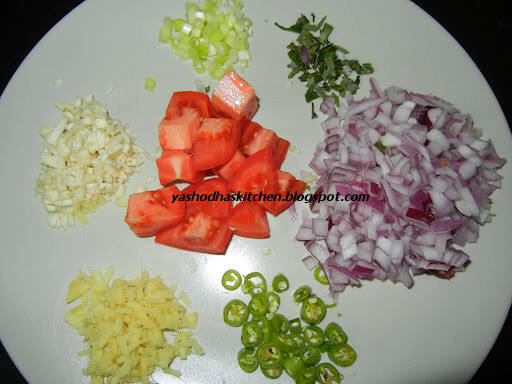 Add tomatoes and fry until it raw smell goes. Fry tomatoes, don't cook it. Add salt, red chilli powder, soy sauce and fry for a minute. Make sure don't burn red chilli powder. If you need to avoid burning, sprinkle little water. Add green onions and fry for a minute. Switch off the stove. Add fried bread slices to the mixture and mix gently. Garnish it with cilantro. 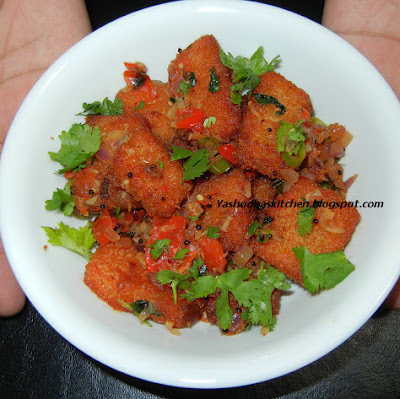 Crispy bread fry is ready. Serve it hot with tomato ketchup. 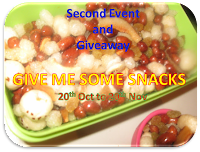 Thanks Viji :) I had added my entries in your blog Viji. Check them . Hey i will try this....its looks Good.......Beyond ur receipe history behind that dish was quite interesting archana! !